An emergency department customizes care for older adults, reducing wait time; screening for risks such as cognitive impairment, medication interaction, and falling; coordinating oversight; and prioritizing aftercare. It's a familiar scenario to emergency department (ED) staff: A 75-year-old patient comes into the hospital with a broken wrist. The emergency physicians help reset the bone, give the patient medication for the pain, and—observing that the patient seems otherwise well—arrange for the patient's discharge. What the staff didn't account for, however, is the fact that the patient lives alone and has no assistance with the tasks of daily living. A few days later, the patient returns to the ED, this time with a different injury—a broken hip. According to the Journal of the American Geriatrics Society, geriatric patients represent 43% of all emergency admissions. Too often, however, these patients are sent home without proper follow-up, only to return with more serious problems and sometimes requiring lengthy stays. Designed to break the cycle of unnecessary geriatric hospitalizations and ED visits, a new program at Crozer-Chester Medical Center in Upland, Pennsylvania, has transformed its ED to better care for older adults. The multitiered effort includes more comfortable facilities, coordinated oversight, and essential supports to monitor patient progress and ensure a smooth transition home. The idea for the program came about two years ago, says William S. Zirker, MD, medical director for Crozer-Keystone Health System's Senior Health Services and chief of geriatrics for Crozer-Chester Medical Center, Taylor Hospital, and Springfield Hospital. At that time, Zirker was developing a strategic plan for geriatrics across the health system. The team recognized that its oldest patients were too often falling through the cracks, either because of inadequate follow-up after discharge or because patients lacked social and financial supports they needed for more effective care. Each month, Crozer sees some 635 patients aged 65 and older, and any efforts to make real change would require big thinking. "The concept we ultimately came up with was to build a geriatric-friendly emergency department," Zirker says. "When we took our proposal to the leadership, everyone agreed that it was a great idea. The ED is the one of the front doors to the hospital and the health system, and we want it to be a supportive environment where patients receive integrated, well coordinated care." Despite the large number of geriatric patients visiting EDs across the nation, EDs have not, on the whole, been designed with this patient population in mind. "EDs are often loud and busy places with a lot of distractions. This can be very overwhelming to older patients who are sensitive to stimulation," says Bruce Nisbet, MD, chair of the emergency department at Crozer-Chester Medical Center. In addition, traditional EDs are not always geared toward the complex medical needs of older adults. "Typically, EDs are designed for adults who are fairly functional. Seniors can have problems with ambulation, cognition, and taking numerous medications that may interact with each other and have cumulative side effects," Nisbet says. "All of these factors make it more challenging to attend to their care." Another challenge for medical centers is that elderly patients visiting EDs are sometimes admitted unnecessarily to the hospital, which is of particular concern given that older people may experience symptoms of delirium in a strange setting and may struggle to return home after an extended stay. The idea of creating EDs exclusively for geriatric patients began to take hold about a decade ago. The ECRI Institute estimates that there are currently 50 geriatric EDs across the country, with another 150 in development. In general, specialized EDs can help divert patients with less acute problems away from the general ED, reducing wait times. They can also help patients connect to underutilized or lesser-known resources in the health system. 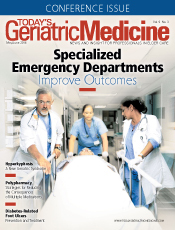 In a geriatric ED, patients are immediately screened for specific health challenges such as cognitive difficulties, risk of falls, potential for medication reactions, and other risks. The six-question risk assessment, called the ISAR (Identification of Seniors at Risk) has been incorporated to help identify which older patients are at higher risk. Those who score high on the ISAR assessment undergo further screenings that assess cognition and the ability to walk safely. When they set out to create the program at Crozer-Chester Medical Center under the auspices of the Crozer-Keystone Center for Geriatric Medicine, Zirker and his colleagues visited St. Joseph's Healthcare System in Paterson, New Jersey. They met with the chairman, Mark Rosenberg, DO, and observed how the department, developed in 2009, was structured. "We were very impressed with the amenities offered to older adults and we were determined to learn from this experience," Zirker says. Indeed, the model informed their own blueprint for a more geriatric-friendly ED. While not officially a geriatric ED, Crozer's ED has been retrofitted to better accommodate older patients with thicker mattresses and more chairs for caregivers. Four beds, called pods, are now devoted to geriatric patients. Large, easy-to-read clocks and televisions have been mounted on the walls. Softer lighting and handrails have been installed, and floors have been covered to make them less slippery. The program's emphasis on comfort includes concierge-style hospitality. From the moment patients walk through the doors, a volunteer greeter ensures careful attention to older adult visitors. "They might offer a cup of tea, some reading glasses, or hearing amplification," Zirker says. "Basically, we want to make sure everyone is comfortable here." The wait time for elderly patients has been reduced, with older patients sometimes being given priority in treatment. Either way, older adults are quickly moved to the customized pods and away from the general waiting area with its busy pace and sensory stimulation. At the heart of the program is a focus on older adults' specific medical needs. Crozer's ED nurses have been trained in the relevant issues related to geriatric care. Crozer also hired Anumeet Cheema, MSN, RN, as a geriatric coordinator. Cheema is on-site five days per week to oversee patient treatment. She works from a care map that Zirker developed, based on the responses to a patient's ISAR screening. The next step might include further screenings, where necessary. Cheema then leverages a combination of in-house and outside services to help patients. Patients often consult with a physical or occupational therapist to determine their ability to return home and perform everyday tasks after an injury such as a broken bone. "A younger person is usually fine to go home with a broken wrist, but for an older person who lives alone, this loss of function could be devastating. We rely on the [physical and occupational therapy] recommendations so we can provide for the patient accordingly," Nisbet says. If patients need a more thorough evaluation but no hospitalization, they are referred to the Geriatric Evaluation and Management Program. They might also be referred to the Center for Dizziness and Balance, nutrition counseling, or mental health services, among others. "About half of our patients get admitted to the hospital and the other half typically go home," Zirker says. "It's the patients who are sent home that are our concern, because we want to make sure their needs are met." Cheema reviews every discharge plan and delivers a clinical and social assessment for each patient, reflecting the particulars of their living situation and support system. She coordinates the patients' follow-up appointments for testing and specialist visits and also works with staff to connect patients to community resources such as senior protective services, home health care, Meals on Wheels, community transit, and the 60+ Aging Waiver Program. Once a patient returns home, a follow-up call or visit from Cheema ensures he or she is staying healthy and keeping safe, minding their next appointments, and following treatment protocols. Crozer's customized approach for older adults goes beyond medical treatment, essentially closing the gap between emergency care and the world beyond. "Overall, it's a more holistic approach," Nisbet says. "We're not just treating the fracture or injury. We're really looking at the whole patient and their life outside of the hospital." The personal attention is essential because elderly patients are often isolated, without friends and family to rely on, Cheema says. "The typical patient who comes in doesn't have family support—either they have no family nearby, or the family is busy and patients can't get the help they need at that given moment." Just having someone to talk to can be enormously helpful for patients who are suddenly faced with navigating frequently overlapping health care needs. What's more, without family to remind or motivate them, patients don't always follow through with aftercare at home. "Many times if they're returning home after an injury, they might have the tendency to sit around more, which is why it's so important to make sure they have physical therapy, skilled nursing, or rehab when needed," Cheema says. Although Cheema is relatively new to the job, she has found the work to be extremely rewarding. "It feels good to know I'm able to help a patient who maybe didn't have enough food in the refrigerator before or didn't have anyone to come check up on him. I know I can help answer their questions and link patients up to the right services, and ultimately help them stay in their home if that's what they want," Cheema says. "My goal is to continue to help as many of our patients as possible." Reducing the need for patients to return to the hospital encourages older adults to live independently with the proper supports. "We are hoping this program helps increase the utilization of home care," Zirker says. "These services can be extremely helpful in keeping seniors at home and reducing their risk of injury. We view the geriatric-friendly ED as something of a screen through which patients get evaluated and their problems are identified before they become worse. It's also a great way to connect them to the vast number of services our health system offers." Ultimately, Zirker would like Crozer-Chester Medical Center's ED to become even more synonymous with senior services. "We now see about 20 geriatric patients a day. In Delaware County [Pennsylvania] the aging population is very large—we are expected to have 20% over the age of 65 by 2020, 5% of whom are above the age of 85. We will see more dementia and more emergency room visits overall, so it's imperative that we know how to properly manage their care." The program is still in its earliest stages, but staff members expect to see a deeper transformation in the coming months, including expanded hours and more resources as awareness grows and better ties to community resources are established. "It's a paradigm shift, and it's a journey," Nisbet says. "But we are expecting great things to come." — William S. Zirker, MD, is the medical director for Crozer-Keystone Health System's Senior Health Services and chief of geriatrics for Crozer-Chester Medical Center, Taylor Hospital, and Springfield Hospital. — Bruce Nisbet, MD, is the chair of the emergency department at Crozer-Chester Medical Center. — Anumeet Cheema, MSN, RN, is a geriatric coordinator at Crozer-Chester Medical Center.